Greens Farms Academy's Blair Pelley continues to be a defensive and offensive threat for the 5-2-3 Dragons. 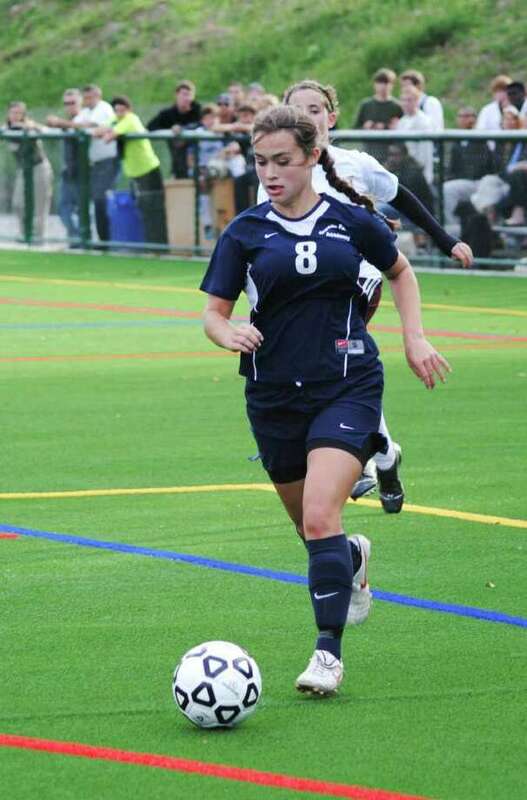 The Greens Farms Academy girls soccer team defeated Holy Child 4-0 and Westover 5-3 last week, and played Brewster Academy 1-1 tie. Against Holy Child, junior Phebe Wong and Hillary Shannon scored two goals each. Wong's first goal came 13 seconds into the game from freshman Campbell Goldsmith. Kiki Kauffman assisted on one of Shannon's goals. Caroline Vanacore led GFA against Westover with two goals. Wong and Emily Caldwell each had a goal and an assist and Blair Pelley scored the team's other goal. Nora Flaherty added an assist for the Dragons. Wong scored GFA's only goal against Brewster Academy. The Dragons played tenacious and steady defense behind senior captains Kate Tomlinson and Sam Brown, Pelley, sophomores Cole Vanacore and Georgie Garner (Westport) and freshman Olivia Lennon. They were backed up by goalies Caroline Kruk and Meghan Donovan (Westport). 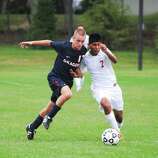 The GFA boys soccer team fought its way to a 1-1 tie against FAA rival Hamden Hall last week. Junior Spencer Hartig scored an unassisted goal 20 minutes into the first half to give the Dragons the lead. That lead held up until nine minutes into the second half when Hamden notched the equalizer. GFA goalkeeper Ryan Friend made many tough saves to preserve the tie. 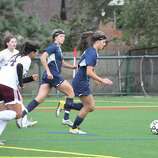 The GFA field hockey team lost 2-0 to Hopkins Oct. 5. The midfield line of junior captain Madison Leonard (Westport), sophomores Maggie Sherin (Weston) and Hayley Holzinger worked hard against a talented Hopkins squad. Defensively, senior captain Isabelle Canaan, junior CJ Rummelsburg and freshman Juliet Fontana played tough in front of freshman goalie Jenny Ross (11 saves). The GFA volleyball team (4-3) defeated Westover 3-0 last week. Offensively, Kiera Wood (eight kills, three blocks) and Westporter Sarah MacDonell (15 assists) led the charge and were supported by Laura Reul with seven kills. GFA did well serving behind Sarah Young (nine aces) and Westporter freshman Claire Comey (seven aces). Young and Comey combined for 28 service points. Defensively, the team relied on the consistent passing of Lucy Hoffman (three digs) and Westporter Rachel Schwimmer (five digs) and great coverage and athletic play by Brooke Cirillo. The GFA boys cross country team went 6-0 at Waveny Park in New Canaan Oct. 5. Continuing their trends of significant improvement over the course of the season were freshman Danny Ross (20:17), junior Brian Bremer (21:10) and junior Henry Yordon (28:06) -- all of whom have dropped three minutes or more off of their 5K times from the beginning of the season. The girls team was led by Olivia Kjorlien (23:54). Freshmen Crosbie Marine (25:39) and Katie Carlson (30:40) made significant improvements from the start of the season. Wills Rooney (16:41) finished third Saturday at the 30th annual Wickham Invitational, finishing one minute behind the winner, Connor Rog of Fairfield Prep.